The cetaceans, a group of 81 different species, are a class of mammals which live entirely in the water. Most are marine, living in salt water. A few cetaceans live in bodies of fresh water such as the Amazon, Yangtze, Ganges, and Orinoco Rivers, as well as in several major Indio-Pacific river systems. This class of mammals includes true whales (having baleen instead of teeth) and toothed whales (whales with teeth, dolphins and porpoises). The "true" or baleen whales have thick rows of tough hairs called baleen lining the upper jaw. True whales take in large quantities of sea water containing small organisms such as krill. As they close their mouths, sea water is expelled and the krill are strained and held back to be swallowed. True whales tend to be larger than toothed whales and have two blowholes (like humans with two nares, or nostrils) which produce a V-shaped blow. Male true whales tend to be smaller than their female counterparts. 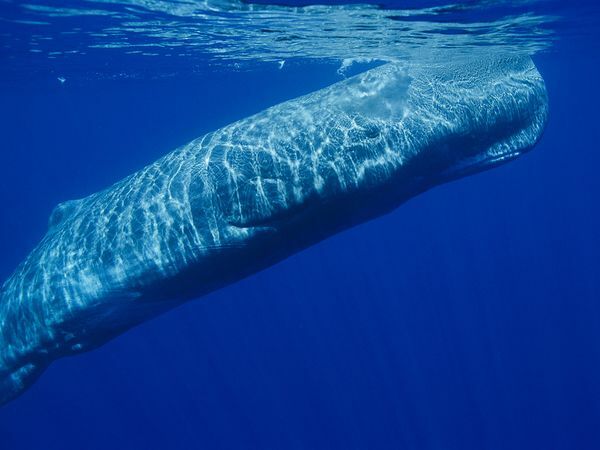 Toothed whales (whales with teeth and without baleen) include animals such as the sperm whale pictured here. 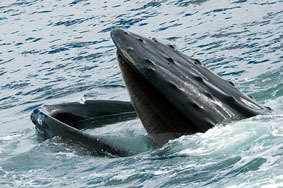 Toothed whales have one blowhole and most (with the exception of the sperm whale) tend to be smaller than true whales. 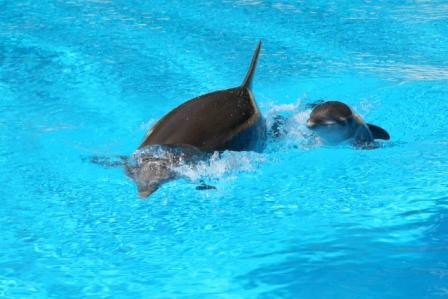 The dolphins include about 33 species of marine (salt water) species such as the Atlantic Bottlenose Dolphin seen here. Dolphins live in all the world's oceans except for those cold waters near the North and South Poles. Dolphins can tolerate water temperatures from about 40 degrees to over 90 degrees F.
There are also 5 species of fresh water dolphins which have a preference for big, murky fresh water rivers. They are smaller than salt water dolphins and have evolved a longer rostrum used to root for food in the murky river bottoms. 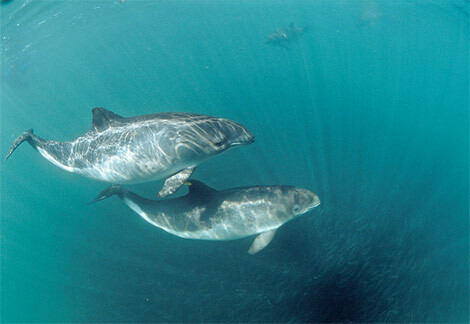 Six species of porpoises have been identified. 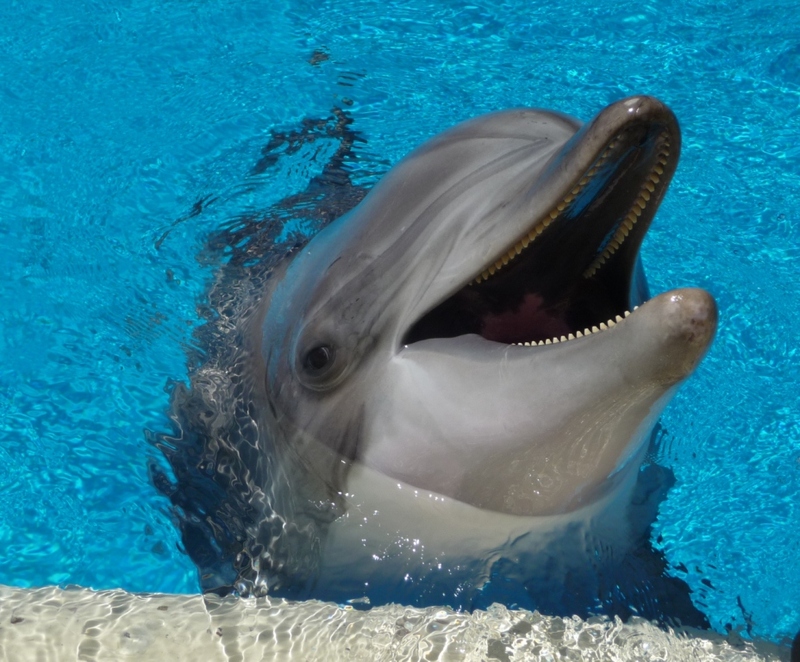 Porpoises and dolphins are often confused, but are very different animals. A porpoise is a smaller animal than most dolphins. 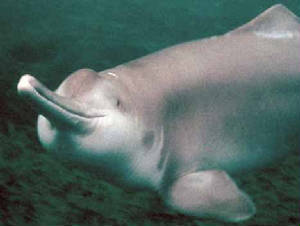 It has spade-shaped teeth instead of the cone-shaped teeth of the dolphin. The neck vertebrae of the porpoise are fused together so it cannot move its head from side to side nor up and down as a dolphin can (a dolphin’s neck vertebrae are jointed). The porpoise has a broader, flatter rostrum and its dorsal fin has a more triangular-shape. Porpoises are usually not seen in captive habitats (although they are in a habitat in Holland) because they are very difficult to train. In the wild they are pelagic animals (they inhabit the open ocean) and are naturally nervous and wary of being eaten. In captivity this nervous nature remains unchanged. Unfortunately, a number of “expressions” which complicate the classification of cetaceans have become commonly used when referring to whales, porpoises and dolphins. We call an orca a “killer whale” when, in fact, it is a dolphin. We classify dolphins and porpoises as whales when, in fact, they are not true whales. We say dolphins “porpoise” when they are seen swimming with continuous leaps above the water surface when, in fact, their behavior has nothing at all to do with porpoises (although porpoises also “porpoise” when they swim). And Mahi-mahi or Dorado, a fish often offered on restaurant menus, is also referred to as “dolphin”. Although the cetaceans have many differences and can be confusing from a classification standpoint, they have three overriding priorities as they go about their lives: feeding, reproduction, and avoiding predation. In the cetacean society, the mother and calf form the basic social unit. The male cetacean is required for reproduction only and generally does not take part in the rearing or feeding of the young.